It doesn't take much to get people riled up on social media these days, whether it's discussions about politics, or, uh, more politics. 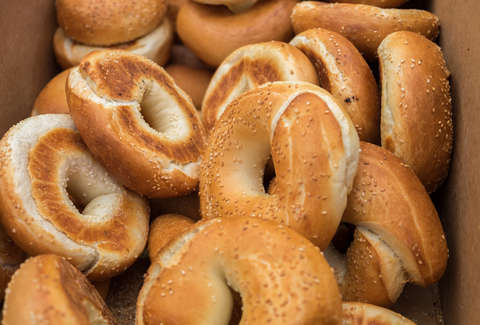 However, a seemingly innocuous photo of bread set off an unprecedented battle royale of opinion on Twitter this week, when a man shared what he described as the "St. Louis secret" to ordering bagels. The brouhaha all began on Monday morning, when a dude named Alex Krautmann tweeted a photo of some strangely sliced bagels from Panera that he brought into his office to introduce coworkers to "the St Louis secret of ordering bagels bread sliced." The unorthodox bagel-slicing style, which renders the hunks of boiled dough into lengthwise-cut bite-sized pieces, did not go unnoticed and as of this writing, Krautmann's tweet has received over 1,000 retweets and 8,400 likes. The carb-obsessed masses did not stay silent on the matter, either, and plenty weighed in with strong feelings. As you can imagine, an overwhelming majority were quick to decry bread-sliced bagels as an abomination of the highest order. Bagel-loving New Yorkers in particular seemed to take serious offense. Others pondered what exactly "St. Louis style" even means. While others simply dismissed the idea that the baked goods in question were even bagels at all. However, some people weren't so thrown by the idea, and came down on the side of Krautmann, who insisted they were a "hit" with his coworkers. When you want a little snack without a whole meal commitment, this makes sense. Looks good to me. 8 bagel tastes for the calories of one. And while this brutally honest discussion about bagel slicing style didn't necessarily come out with one clear winner, Alex Krautmann certainly walked away with something because even Panera weighed in on the matter and offered to hook him up with a free order of bagels "sliced however [he'd] like."